Below is a step-by-step instruction on installing Windows PowerShell on Windows Server 2008 in Server Core mode. Note that these are in no way official or supported by Microsoft. Microsoft is working on official version of .NET and PowerShell for Server Core installations, so eventually you will be able to get this fully supported. Until then below are the instructions you can use at your own risk, etc., etc. Windows Server 2008 has a command-line installation option – Server Core – which significantly reduces the attack surface and patch requirements by the virtue of not having Explorer and other UI components not needed in datacenter. The problem is that it only ships with traditional cmd.exe and not PowerShell. To make things worse neither PowerShell nor .NET as they are today can be installed on such systems. Installing Visual C++ Redistributable Packages (required for .NET). After that, copy these files to your Server Core computer (e.g. using Robocopy) and simply run them there. 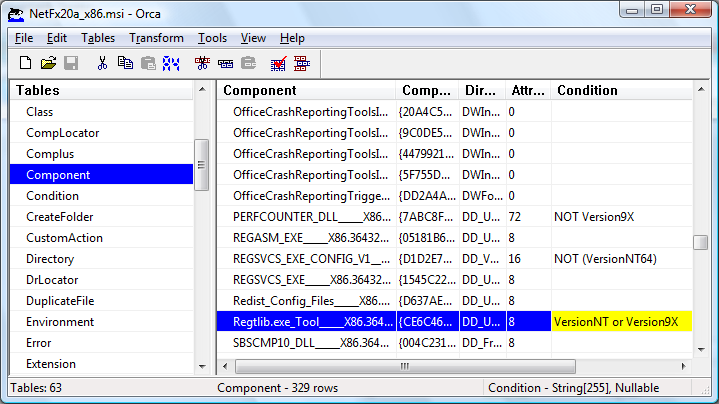 If your Server Core is 32-bit – just run vcredist_x86.exe. If it is 64-bit, you need to install both x86 and x64 versions (vcredist_x86.exe and vcredist_x64.exe). Unpack the setup to get access to the .NET 2.0 Service Pack 1 installation files. Use Orca to remove the Windows version check. 2.1. Download .NET: Go to Microsoft’s web site and download full redistributable package of .NET 3.5.
b. Save the downloaded .NET framework package to this folder. c. Download the wonderful deploy.cmd script which Artem has posted and put it into the same folder. After the script executes, the C:\Deploy\AIP folder will have both NetFx20_x64 and NetFx20_x86 folders with .NET 2.0 framework files you need. This is great but unfortunately you cannot just install the files because the MSIs are specifically checking for Windows version. So now we need to disable this check. To do this we will use Microsoft’s Orca MSI editor. Note: This all needs to be done on a regular, not Server Core, machine. We will copy the results of our Orca operations to the Core box later on. 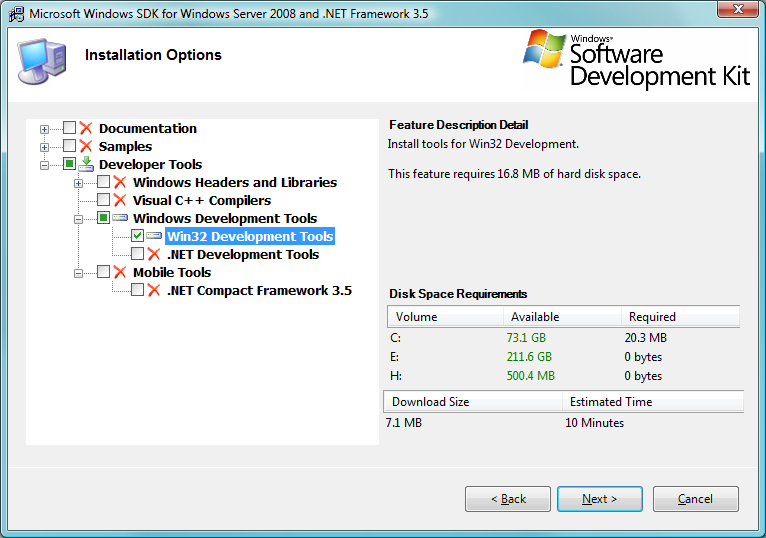 a. Download the Windows SDK for Windows Server 2008 and .NET Framework 3.5 installer. c. After the installation completes, go to C:\Program Files\Microsoft SDKs\Windows\v6.1\Bin and install Orca.msi. Now its time to do some patching. a. Start Orca and open the MSI you need (C:\Deploy\AIP\NetFx20_x86\NetFx20a_x86.msi for 32-bit version or C:\Deploy\AIP\NetFx20_x64\NetFx20a_x64.msi for x64). d. Change the Condition from (VersionNT < 600) or Version9X to just VersionNT or Version9X. %SystemRoot%\system32\msiexec.exe /package "NetFx20_x64\NetFx20a_x64.msi" vsextui=1 transforms="ServerCore.mst"
That’s it. Now we have .NET installed and can go to the final step – PowerShell installation! There is no PowerShell v1 setup for Windows 2008 (again, because it is supposed to be a component) but you can actually download and install the CTP (note: this is a pre-beta code – not for production use). PowerShell v2 CTP2 is available from Microsoft’s downloads page. Download the version you need, copy the msi over to the Server Core box and simply run the msi. Now you can start PowerShell! That’s it. Now you are among the first geeks in the Universe to have PowerShell on Server Core! Acknowledgments: I could only have this all accomplished thanks to the help I got from Alex Kibkalo and a great post by Artem Pronichkin on installing .NET on Server Core. Very sweet! Too bad it isn’t supported- that means this won’t make it out of the lab because of policy. D’oh! GREAT Article!!! This is awesome. I knew that its possible and now you gave steps in How-to. I will be putting it to work within the next few days. Thanks. what does this do to maintenance? Will software update patch these hacked-in components? If not this seems to defeat the whole small-footprint lower-maint goal of server core. Does psh on core offer an advantage? Wouldn’t it push toward local management rather than remote, as intended? Please read the post again. Right now this is an unsupported configuration. If you deploy it you have to take care of patching, etc. When official package is released by Microsoft you will obviously be able to rely on their patching. PowerShell on core (especially when cmdlets become available for core specific management) will offer significant advantages over the current set of utilities managed from cmd.exe. Are we there already? Not yet, but this is coming and will eventually make Server Core a much more compelling story. Dmitry, once again for a great blog. I found myself some pitfalls in the section of upackaging the .NET Framework 3.5 so I blog on the steps for those who might end up in the same situation. Now, I can remotely connect to my test Server Cores and run PowerShell scripts. Thanks Max! I guess I should have been more explicit in the Orca section: Yes, Orca needs to be installed and used on a regular computer, and you only need to copy the processed files to the Core afterwards. Thanks Dmitry, I’ve added a link here in the beginning of my post. Strange, trying to execute SDK setup.exe application warns me it cannot be installed because it needs Framework 2 in order to continue. Any idea of what’s happening ? The folders in deploy dont get filled with that script for me (windows xp sp3). Okay, copied it to a different drive, edited the work folder in the script and it worked perfectly now. I prefer a much quicker route. 1. Download .NET Fx 2.0 Redist and right-click Extract here. 2. run “netfx.msi /qb ADDEPLOY=1 DD_IE501FOUND_X86.3643236F_FC70_11D3_A536_0090278A1BB8=True” from command-line. I followed your instructions and everything went fine up to the point of running the command to install .net on the server core machine. I get a dialog box saying there is a problem with this Windows Installer Package ..Please refer to the setup log for more information. Any clues on what might be stoppig the install ? Are you sure you saved the changes to the msi file (and not as another tranform)? Finally, you can try the alternative posted by MLT just above your comment. MLT, wow! Looks like an easier alternative. Learning something new every day! 1. Config hierarchy not quite there. I had to add an EXE config to the console app I ran and include a section. Apparently no where up the chain did it exist. Not surprising. 2. I tested this on a 32-bit install, not 64-bit. I will try that later when I setup the real box. 3. I am sure the eventual official install will rip out things I have yet to find that may fail, but all the basics work great. So the reason this was left out was to reduce the footprint, attack surface, patch surface. Plus you can enable WinRM and WinRS to run PS commands and scripts from a remote system, or just target the remote system in the PS command to begin with. > So the reason this was left out was to reduce the footprint, attack surface, patch surface. Yes and no. This is a matter of choice and to some admins PowerShell can be a great additional feature of server core improving its manageability. With that said, the current way of installing it, described above, is for labs, rather than for production environment. Supported production procedure is coming from Microsoft and will address patching, etc. > Plus you can enable WinRM and WinRS to run PS commands and scripts from a remote system, or just target the remote system in the PS command to begin with. Not really. PowerShell v2 remoting requires not just WinRM, but also PowerShell v2 on BOTH ends. Without it, all you can do is basically WMI calls – a tiny subset of the functionality. QAD cmdlets also work remotely for Server Core DCs. And that is probably it. Access denied on Step 3? When running the msi on the server core? Can you make sure you are local administrator on the system? Im logged in as administrator so i dont expect permissions problems, i was running the msi from an external drive so i decided to copy the msi to the c:\ drive but im still getting the same access denied. I downloaded powershellv2 ctp so im not sure if that has anything to do with it. Server Core is on FIRE! Important once we go live with .NET all patch work is on us like you said to Don, but I think it pays to have the BOX more manageable. BACS can run, the gui, on Hyper-V server now that 2.0 can be installed. I’ve tested it and everything works flawless. VLAN, Offloading, and teaming (with the latest drivers for your card) are easily setup now. Dmitriy, well spoken. Awesome hack. P.S. Don’t know why wordpress was discarding the Russian comment. Some weird antispam algorithm kicking in, I guess. That’s a pity. I obviously did everything long before the SP. I don’t have the lab to re-work the whole procedure again, but my gut feeling is that the issue is probably not with the Server SP, but probably with the change of the condition test in .NET setup. If you have time, I would recommend checking various conditions in there and disabling them. Fantastic, I didn’t know about this topic up to now. Thanx! This post was back from early 2008. 🙂 So all the instructions apply to Server 2008 – not R2 which indeed has native support. I think I need to update it with the link you posted so people do not get confused. Thanks for the reminder! PowerShell v2 CTP2 is available from Microsoft’s downloads page. I found this, working on something for school; it doesn’t unpack the files for the .Net Framework (2.0, 3.0 or 3.5). Yes, I put all the downloads in the correct folder and run the deploy.com script from there, but still nothing. 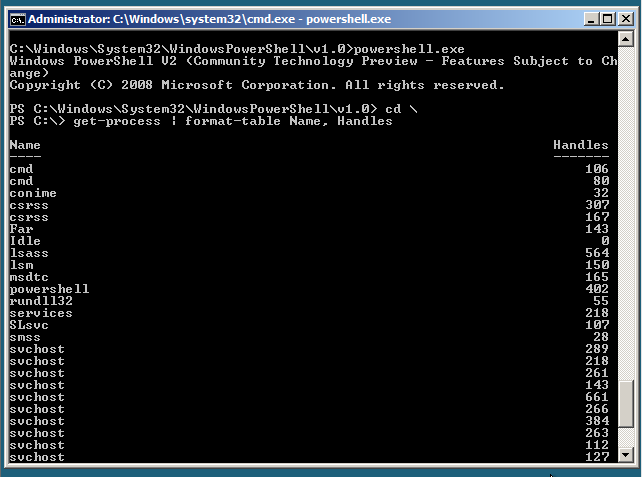 I have not been doing this for a while now that Windows Server 2008 R2 supports PowerShell on core natively. So yes if Microsoft changed some of the packages since then, I guess you need to find how to get the files from the new ones. Please post back the info if you manage to find the new way. Or switch to R2. All you are doing is just copying the work of someone else (Artem Pronichkin) which is originally written in Russian and translating it to English and grabbing attention. Since this post is in English, this post has gotten more attention than the Russian one which is not that understandable by everyone. If you Ctrl-C, Ctrl-V the original post section by section in Google Translate, anyone will see that you have done zero effort on this other than that of the job of a translator. I know you have given the name of the original author in this post, but it is sad to see most of the credit goes to u, not to the original person who actually made the effort to make this possible. Can’t find PowerShell v2 CTP2 to download. I need it for Windows 2008 Server Core.